The Peru Map Template in PowerPoint format includes two slides, that is, the Peru outline map and Peru political map. Firstly, our Peru outline map template has capital and major cities on it, which are Lima, Arequipa, Trujillo, Chiclayo, and Huancayo. Secondly, there are 25 regions and the Lima Province in our Peru political map, labeling major divisions that are Lima Province, Piura, La Libertad, and Cajamarca. Slide 1, Peru map labeled with capital and major cities. Our Peru map is for the country located in western South America, bordering Ecuador and Colombia in the north and, Brazil in the east, Bolivia in the southeast, Chile in the south, and the Pacific Ocean in the west. Since Lima is the capital and largest city of Peru, in addition to other major cities including Arequipa, Trujillo, Chiclayo, and Huancayo. So our Peru map slide has the capital and major cities on the outline. 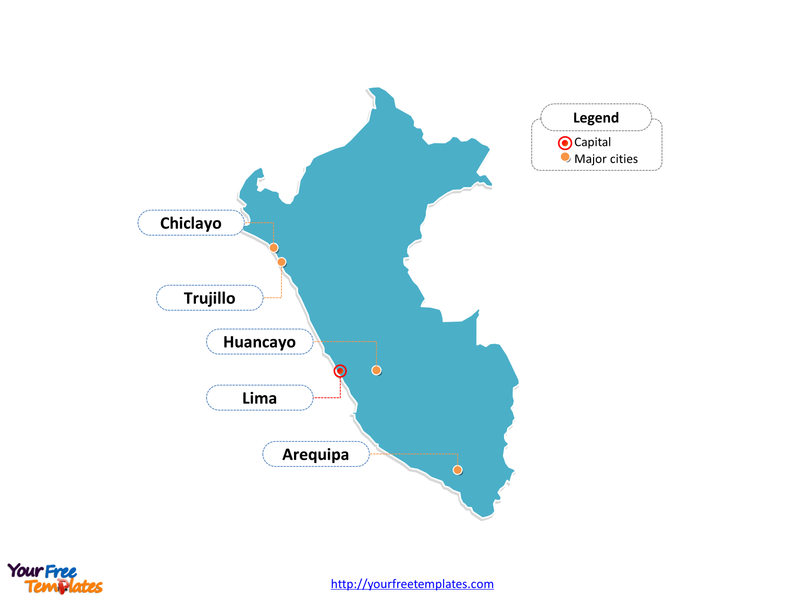 Consequently users can remove cities or include new ones to create their unique Peru maps and suit their specific applications. Slide 2, Peru map labeled with major regions. The Peru map is the country political division of 25 regions and the Lima Province. They are Amazonas, Ancash, Apurímac, Arequipa, Ayacucho, Cajamarca, Callao, Cusco, Huancavelica, Huánuco, Ica, Junín, La Libertad, Lambayeque, Lima, Lima Province, Loreto, Madre de Dios, Moquegua, Pasco, Piura, Puno, San Martín, Tacna, Tumbes, and Ucayali. Furthermore every individual political subdivision is an editable shape. As a result, you can change the texts, colors, sizes, highlight some map shapes, and add your content. At the same time you can also refer to the fully labeled Peru map in Wikipedia Peru. 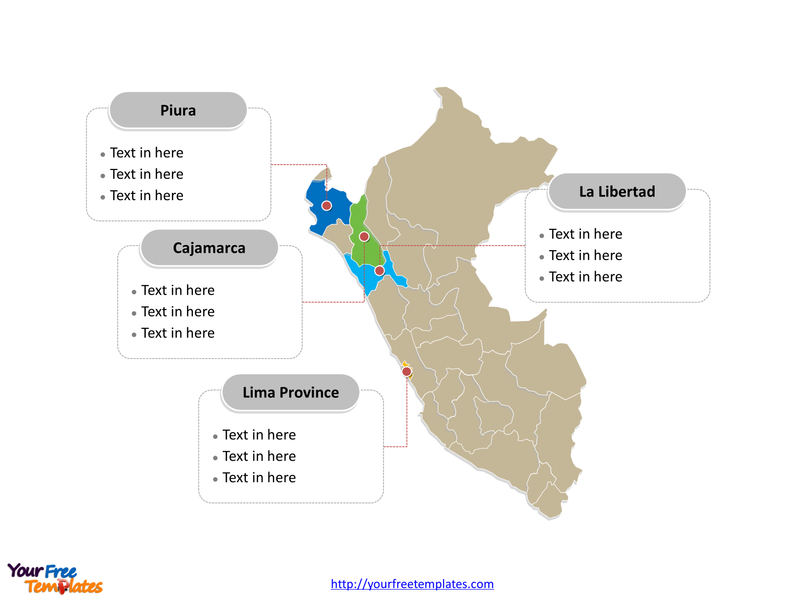 Therefore Analysts from marketing research companies, or consultants from professional firms will find our Peru map templates very helpful in their projects. Because our maps can assist them communicating effectively. Click the blue button to download it. Click the green button to download it. YourFreeTemplates.com is your free PowerPoint templates website. We provide you with the high-quality, attractive and latest maps, charts and diagrams.